Go with the Artisanal Creations Set of 2 Natural Crystal Knobs if you want to give your home interiors an authentic and natural touch. Craftsmen from Agra have used the skills passed on to them through generations and handcrafted these drawer pulls out of natural crystals. Various crystals are fixed on a metallic base, so each piece in the set is unique, making these knobs a perfect choice for adding character in your living space. 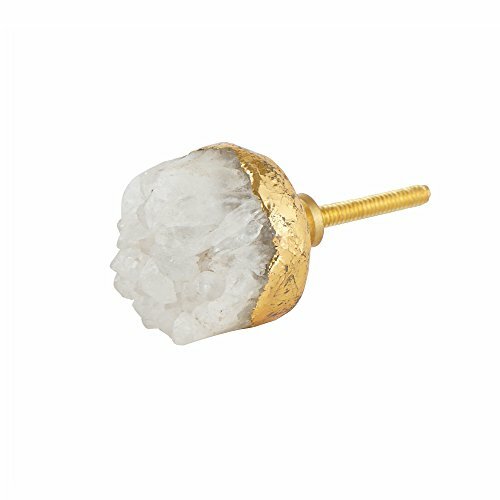 These handcrafted cabinet pulls have a mean diameter of 1.5 inch, which can vary according to the size of the crystals, and a projection of 1.5 inch for a comfortable hold over the knob. These DIY knobs come with a detailed set of instruction and the hardware required for quick and easy installation. We use premium materials and pursue creativity to create exquisite furniture hardware options like the natural crystal knobs. Set of 2 Decorative Knobs: Give your home interiors a natural and authentic touch with this set of 2 decorative cabinet knobs. These knobs can be used with any type of décor theme. Natural Crystal Knobs: Each knob in this set of 2 is made with the use of natural crystals fixed on a metallic base. The use of natural crystals means that each knob will be slightly different from the other, giving them more character. Handcrafted Stone Knobs: These ornate cabinet pulls have been handcrafted from natural stones fixed on a metallic base. Craftsmen from Agra, the city if Taj Mahal, have used the skills handed down to them through generations to make these elegant knobs. Easy DIY Installation: This set of 2 drawer pulls come with all the instructions and the hardware required for quick and easy installation. You would require a hand drill or a 1/8 inch hole for installing these knobs. Ornate Knob Dimensions: The cabinet knobs in this set of 2 have a mean diameter of 1.5 inch, which may vary, and a projection of 1.5 inch for a comfortable grip. The 2 inch bolt of the knob can be trimmed to size according to the installation requirement.